International air from the U.S. has not been included in the cost of this safari. Sesriem Canyon: Sesriem Canyon has evolved through centuries of erosion by the Tsauchab River which has incised a narrow gorge about 1.5 km long and 30 m deep into the surrounding conglomerates, exposing the varying layers of sedimentation deposited over millions of years. The shaded cool depths of the canyon allow pools of water to gather during the rainy season and remain for much of the year round. These pools were a vital source of water for early settlers who drew water for their livestock by knotting six (ses) lengths of rawhide thongs (riems) together. Accordingly, the canyon and surrounding area became known as Sesriem. Desert Homestead Outpost is ideally located only 31.5km from Sesriem, the gateway to the Namib Naukluft National Park. Accommodations are in comfortable thatched en-suite chalets, designed with little touches in mind that characterize the Homesteads homely hospitality. Deep in the 7000 ha nature reserve of Desert Homestead Lodge the Outpost opens its gates and offers relaxed hospitality with a natural atmosphere. Enjoy the impressive panoramic view from the 11 houses, the family apartment or the main house with restaurant, lounge and pool area, set at the base of a mountain. On the wide open plains cheetahs may often be seen, roaming the endless grasslands. Guests are welcome to take advantage of all activities of the Desert Homestead Lodge excursions to Sossusvlei as well as horse-safaris or Sundowner drives. Sossusvlei: This most frequently visited section of the massive 50,000 km² Namib Naukluft National Park has become known as Sossusvlei, famous for its towering apricot colored sand dunes which can be penetrated by following the Tsauchab River Valley. Sossusvlei itself is a clay pan in the middle of the dunes, many of which stand 300 meters above the surrounding plains, ranking them among the tallest dunes on earth. The deathly white clay pan contrasts against the orange sands and forms the endpoint of the ephemeral Tsauchab River, within the interior of the Great Sand Sea. The river course rises south of the Naukluft Mountains in the Great Escarpment. It penetrates the sand sea for some 55 km before it finally peters out at Sossusvlei, about the same distance from the Atlantic Ocean. Until the encroaching dunes blocked its course around 60,000 years ago, the Tsauchab River once reached the sea; as ephemeral rivers still do in the northern half of the Namib. Sand-locked pans to the west show where the river previously flowed to before dunes shifted its endpoint to where it currently gathers at Sossusvlei. Roughly once a decade rainfall over the catchment area is sufficient to bring the river down in flood and fill the pan. The town of Swakopmund resembles a small, German coastal resort nestled between the desert and the sea. It boasts a charming combination of German colonial architecture blended with good hotels, shops, restaurants, museums, craft centres, galleries and cafes. Swakopmund had its beginnings as a landing station in 1892 when the Imperial Navy erected beacons on the site. Settlers followed and attempts to create a harbour town by constructing a concrete Mole and then iron jetty failed. The advent of World War I halted developments, and the town sank into decline until half a century later when infrastructures improved and an asphalt road opened between Windhoek and Swakopmund. This made reaching the previously isolated town quicker and easier, and it prospered once again to become Namibia’s premier resort town. Although the sea is normally cold for swimming, there are pleasant beaches and the cooler climate is refreshing after the time spent in the desert. The Hansa Hotel dates back to 1905 and is a timeless classic part of Swakopmund’s architectural culture. Conveniently located in the center of town, it is within easy walking distance of the waterfront, shops, cafes, the aquarium, Crystal Gallery, and other attractions Swakopmund has to offer. The Hansa Hotel is world renowned for its outstanding cuisine and comparable with the most prestigious addresses encountered abroad. This luxurious residence places emphasis not only on personalized service and elegant style, but also on affordability. Twyfelfontein: Strewn over a hillside amongst flat-topped mountains of red sandstone, Twyfelfontein’s boulders and slabs of red sandstone hold some 2,500 prehistoric engravings that depict wildlife, animal spoor, and abstract motifs. It is perhaps the largest and finest collection of petroglyphs in Africa. The .engravings show animals such as elephant, giraffe, kudu, lion, rhinoceros, springbok, zebra, and ostrich that once used to drink from a fountain at the bottom of the hill. In some cases, footprints were engraved instead of hooves or paws. The abstract motifs feature mainly circles. Stone tools and other artifacts found at Twyfelfontein suggest that hunter-gatherers occupied the site over a period of perhaps 7,000 years. 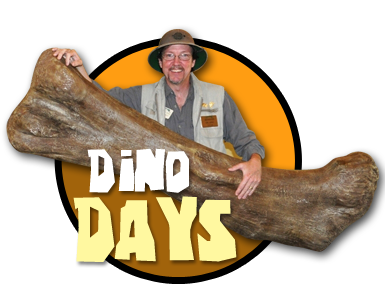 These days a local guide accompanies visitors to showcase the rock art. The engravings lie along two circular routes, one an hour’s climb and the other 40 minutes longer. Twyfelfontein is one of Namibia’s key National Monuments and has recently become a UNESCO World Heritage Site. Burnt Mountain: A rounded hill located a few kilometers from Twyfelfontein and the Organ Pipes, known as the Burnt Mountain, seems to catch fire again at sunrise and sunset. Its fantastic range of colors at dawn and dusk are due to a chemical reaction that took place roughly 125 million years ago when molten lava penetrated organic shale and limestone deposits, resulting in contact metamorphism. In ordinary sunlight it is a dull black. Blackened rubble lies to one side like cinders from the original fire. Organ Pipes: The Organ Pipes are another geological curiosity in the area consisting of a mass of perpendicular dolerite columns that intruded the surrounding rocks also about 125 million years ago and have since been exposed in a ravine due to river erosion. Camp Kipwe: Camp Kipwe in the heart of Damaraland is ideally located a short drive from the local attractions in the area. The Camp is nestled amongst an outcrop of giant granite boulders, a stone’s throw away from the ephemeral Aha Huab riverbed where desert adapted elephants often traverse. Each comfortable thatched bungalow is simply but tastefully furnished with en suite open-air bathroom. In the center of the camp there is a large alfresco dining area, bar, lounge, and reception with an inviting fireplace nearby to relax beside in the evenings. A refreshing swimming pool and sunset lookout with lovely views also complement the Camp. Desert Adapted Elephant: In habitats with sufficient vegetation and water, an adult elephant may consume as much as 300 kg of roughage and drink 230 liters of water every day. Consider what a herd of them would eat and drink in a week or a month or a year; it seems inconceivable we’d find African elephants in a desert! However, not only elephant, but other large mammals such as block rhinoceros and giraffe thrive in this inhospitable environment. Their ranges extend from the river catchments in northern Kaokoveld to the northern Namib. In addition to Kunene, seven other river courses north of the Ugab provide these animals with routes across the desert, right down to the Skeleton Coast. Desert adapted elephant in Kaokoland and the Namib walk further for water and fodder than any other elephant in Africa. The distances between water holes and feeding grounds can be as great as 68 km. The typical home range of a family herd is larger than 2,000 km² or eight times as large as that for elephants in central Africa. They walk and feed at night and rest during the day. To meet their nutritional requirements they browse on no fewer than 74 of the 103 plant species found here. Although not a separate species, these animals are an ecotype unique to Namibia, behaviorally adapted to hyper-arid conditions. The Himba and other Herero people who inhabit Namibia’s remote north-western Kunene Region are loosely referred to as the Kaokovelders. They are semi-nomadic pastoralists who move from one watering place to another. The largest group of Kaokovelders is the Himba, who live in scattered settlements throughout the Kunene Region. They are a tall, slender and statuesque people, characterized especially by their proud yet friendly bearing. The women especially are noted for their unusual sculptural beauty, enhanced by intricate hairstyles and traditional adornments. They rub their bodies with red ochre and fat, a treatment that protects their skins in this harsh desert climate. The homes of the Himba are simple, cone-shaped structures of saplings, bound together with palm leaves and plastered with mud and dung. The men build the structures, while the women mix the clay and do the plastering. A fire burns in the headman’s hut day and night, to keep away insects and provide light and heating. A family may move from one home to another several times a year to seek grazing for their goats and cattle. Men, women, and children wear body adornments made of iron and shell beads. A Himba woman may spend as much as three hours a day on her toilette. First she bathes, then she anoints herself with her own individually prepared mixture, which not only protects her skin from the harsh desert sun, but also keeps insects away and prevents her body hair from falling out. She uses another mixture of butter fat, fresh herbs, and black coals to rub on her hair, and ‘steams’ her clothes regularly over the permanent fire. Men, women, and children adorn themselves with necklaces, bracelets, anklets, and belts made from iron and shell beads. With their unusual and striking designs, these items have gained a commercial value and are now being produced on a small scale for the urban market. Sculptural headrests in particular are sought-after items. The Ongava Game Reserve is effectively a private game reserve, spanning 30,000 hectares along the southwest border of Etosha National Park. The reserve is home to a wide variety of game including lion, leopard, giraffe, rhino, Hartmann’s mountain zebra, gemsbok (oryx), kudu, steenbok, and much more. The scenery is attractive with large open plains blending into Mopane tree woodlands and granite outcrops. Andersson’s Camp: Located just 4.5 km from Etosha National Park’s Andersson Gate, Andersson’s Camp takes its name from Charles Andersson, the Swedish explorer who first “discovered” the Etosha Pan with Sir Francis Galton in 1851. Set against a backdrop of the low Ondundozonanandana Mountains, Andersson’s Camp is located within the private Ongava Game Reserve which borders onto Etosha National Park. The Ongava Game Reserve is typified by white calcrete soils, rocky outcrops, and scrub-covered plains which support a rich variety of game such as giraffe, lion, rhino and various antelope species. The Camp overlooks a waterhole where guests can enjoy the interaction of wildlife coming and going throughout the day and night. This former farmstead has been tastefully rebuilt to modem-day standards. The design and construction of Andersson’s Camp was guided primarily by the principles of environmental sustainability – reduce, reuse, recycle. The old farmhouse now forms the main dining, bar, and swimming pool areas of Andersson’s Camp, with guest tents radiating outwards into the secluded Mopane woodlands typical of the region. Tents are constructed using a clever mix of calcrete stone cladding, canvas and wood, with double-door entrances and a small veranda that is an extension of the elevated wooden decks on which the tents are raised. The open-air en suite bathrooms continue the unique design. Andersson’s Camp’s close proximity to Etosha National Park is ideal for game drive excursions into Etosha to take in the array of game found there. Etosha National Park covers 22,270 km², of which approximately 5,000 km² is made up of saline depressions or “pans”. The largest of these pans, the Etosha Pan, can be classified as a saline desert in its own right. The Etosha Pan lies in the Owambo Basin, on the northwestern edge of the Namibian Kalahari Desert. Until three million years ago, it formed part of a huge, shallow lake that was reduced to a complex of salt pans when the major river that fed it, the Kunene, changed course and began to flow to the Atlantic instead. If the lake existed today, it would be the third largest in the world. Etosha is the largest of the pans at 4,760 km² in extent. It is nowadays filled with water only when sufficient rain falls to the north in Angola, inducing floods to flow southward along the Cuvelai drainage system. The Park consists of grassland, woodland, and savannah. Game-viewing centers located around the numerous springs and waterholes are where several different species can often be seen at one time. The park boasts some 114 mammal and over 340 bird species. Wildlife that one might see includes elephant, lion, giraffe, blue wildebeest, eland, kudu, gemsbok (oryx), zebra, rhino, cheetah, leopard, hyena, honey badger, and warthog, as well as the endemic black faced impala. Day 14 – ARRIVE U.S.
We return to our homes with many fond memories of our wildlife safari in Southern Africa. award winning Namibian conservancy program. This spacious and comfortable main lounge and dining area are built on an elevated wooden deck, providing breathtaking views across the papyrus floodplains and reed bed permeated channels. Guests are housed in tented units, all elevated on stilts. 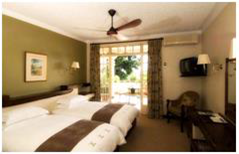 All units have en suite bathrooms, fans, mosquito nets, tea/coffee station and an in-room safe. 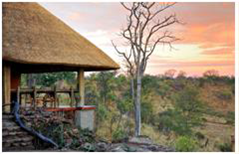 Each tent has its own deck which affords fantastic wildlife viewing opportunities. 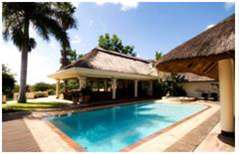 The lodge has a swimming pool and guest lounge and also offers a laundry service. Please note: The Air Namibia regional flight from Eros Airport to Katima Mulilo currently only flies on Mondays, Wednesdays, Fridays and Sundays at 10:15 AM ond subject to change with limited notice. Established in 1990 the 32,000ha Nkasa Lupala National Park has the distinction of being the largest wetland area with conservation status in Namibia. 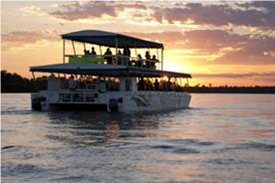 The park is characterized by a complex network of channels, reed beds, oxbow lakes and tree covered islands, with the focal point on the Kwando and Linyanti rivers. During the dry season the islands can be reached by road, but after the rains, 80% of the area becomes flooded, cutting them off from the mainland. Nkasa Lupala is home to the largest concentration of African buffalo in Namibia as well as a variety of other wildlife species. With more than 430 species recorded, this area is also a birders paradise. Wild is the one word that best describes Nkasa Lupala (formerly Mamili) National Park. It is an extraordinary piece of wilderness, waiting to be explored. Lush marshes, dense savannah and high river reeds mean that traveling through the area is a dream for 4×4 enthusiasts. During the dry winter months, large herds of elephant congregate on Nkasa and Lupala islands. But for much of the year, the park is awash with floodwater. Game drives go along the edge of deep pools and close to rivers where crocodiles lie in wait. Nearby buffalo or elephant may be crossing the river. For anyone who relishes the adventures of raw, real Africa, Nkasa Lupala is the place to be. 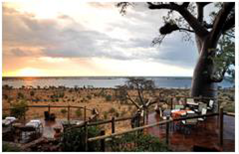 Ngoma Safari Lodge is located on a rocky outcrop, high on an escarpment, in the Chobe Forest Reserve, which borders the western edge of Chobe National Park. 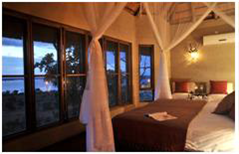 Ngoma is an intimate lodge with panoramic views over the Chobe River and Caprivi floodplain. Accommodations are in eight comfortable, river facing, free-standing brick and thatch cottages with a small internal and external living space. The en suite bathrooms are open-plan (separate toilet) raised behind the bedroom. Each cottage features an indoor and outdoor shower, air-conditioning and fan, mini bar, tea and coffee facilities, and outdoor plunge pool. Two of the cottages include an Indian day bed (triple room). With a rustic and ethnic accent of natural materials and finishes, the central guest area is adjacent to a magnificent Baobab with uninterrupted river views. There is a reception, small guest sitting room next to the bar, a dining room, small swimming pool, sundeck, and extra viewing platform. Ngoma offers up to four activities a day with a choice of nature walks and night drives in the Forest Reserve concession, day game drives in Chobe National Park with a picnic lunch, a full day game activity including a cruise on the Chobe River, birding and cultural interactions with the local community. All meals, local brand drinks, 2 scheduled safari activities daily, return road transfers from Kasane Airport or Kazangula Border, park fees, community levy, and laundry are included. Activities include: morning walk or drive, afternoon walk or drive, night drive, full day safari inclusive drive and cruise, cultural/community tour and night drive. The iconic town of Victoria Falls, affectionately known as “Vic Falls”, is located on the southern bank of the Zambezi River, at the western end of the mighty Victoria Falls. Zimbabwe’s prime tourist destination and a magnet for visitors from around the world, Vic Falls has a rich and romantic history. Discovered in 1855 by explorer and missionary David Livingstone, the railway from Cape Town arrived in 1904 and the landmark 198 meter long Victoria Falls Bridge, spanning the immense Zambezi River gorge and linking Zimbabwe with Zambia, was built in 1905. One of the Seven Natural Wonders of the World and a UNESCO World Heritage Site, the Victoria Falls is one of Africa’s greatest geographical features. At 1700 meters wide and over 100 meters in height, visitors cannot fail to be inspired and amazed by the sheer size, power, and beauty of the thundering curtain of water which can be gazed upon from 16 view points along a network of trails through the surrounding rainforest. Reaching their zenith in April/May, the Falls are at their most powerful and impressive between the months of February and July. At high water, the dense plume of spray can rise up to 500 meters into the air and is visible from as much as 20 kilometers away, justifying why the falls are still commonly referred to by their local name of Mosi-oa-Tunya – “the smoke that thunders”. Even during the low water months of October and November when the Falls become dry for much of their length, the view from the Zimbabwe side won’t disappoint. With its welcoming small town atmosphere, Vic Falls is home to a seemingly endless number of activities – there is literally something for everyone. The world’s wildest while water rafting, canoeing, helicopter flips, elephant back safaris, canopy tours and adventure slides, river cruises, golf and bungee jumping. An impressive array of arts and crafts is showcased by talented local artists in the open air curio market as well as at a number of galleries and shops throughout town. 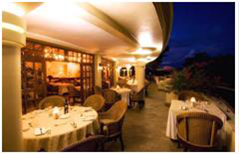 Located in the Zimbabwe town of Victoria Falls, the boutique Ilala Lodge is the closest hotel to Victoria Falls. Its secluded setting overlooks green lawns, borders the lush National Park, and has views of the “smoke” of Victoria Falls. Its 32 rooms and two suites ore furnished with railway sleeper teak. Patio doors open onto either a communal garden or a balcony, where rooms on the upper level afford a view of the spray of the Falls. Standard in each room are two ¾ beds, en suite bathrooms with a shower, bath and bathroom amenities, air-conditioning, fan and tea and coffee facilities. Suites are larger and include a king size bed. With warm and elegant decoration evoking an era of early adventure, the main guest facilities include the a la carte Palm Restaurant and veranda which is open daily for breakfast, lunch, and dinner; the Safari Salon, a swimming pool, terrace bar and WiFi. From it s prime location, guests at Ilala Lodge can enjoy scenic helicopter flights and interactive elephant back safaris or high adrenalin activities such as bungee jumping and white water rafting. Day 21 – VICTORIA FALLS and JOHANNESBURG, DEPART FOR THE U.S.
Victoria Falls reaches its zenith in about May each year. It is a truly awe-inspiring experience- the sight, the sound, the smell, and the humbling feeling that here indeed, is Nature’s Supreme Masterpiece. No photograph can begin to depict the reality and nothing prepares you for your first sight. This tour is conducted in the morning and afternoon and is 2 hours in duration. You will be accompanied through the rainforest by a qualified guide who gives a brief history of the Falls and the surrounding flora, fauna, bird, and wildlife. Raincoats and bags to protect cameras are provided when needed. Day 22 – ARRIVE IN U.S.